At Damhead, we provide a range of kennels with access to covered runs. Our kennel block is heated and thermostatically controlled ensuring a constant ambient air temperature is maintained all year round. We are also happy to walk dogs off lead but only with your express permission. 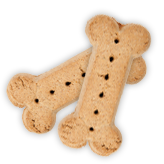 At Damhead we feed a complete food for dogs, though this can be supplemented with other food for those used to a more meaty diet. We are happy for you to bring your own food should a special diet be required. We follow the feeding pattern that your pet is used to at home, so if it’s once, twice or three times a day, let us know and we will do the same. Beds and specialist cosy vet bedding is provided and changed regularly during your pet’s stay, and if you wish, feel free to bring along any favourite toys etc.